Colds. They sneak up on you, then just linger. You don’t feel better or worse, but they refuse to leave and insist on making even simple everyday tasks feel like wading through treacle. Everything is such an effort. It’s at times like this that I take to my bed and dream of comfort food. I may not want the dark rum-laced warm milk my mum used to give me as a child but I still want something that will give me a warm food hug. Almost anything with buttery mashed potato will do. As will my other half’s chicken casserole that is comforting because it is one part tasty and one part ‘I didn’t have to cook this myself’. So, after a week of soldiering on through commitments, I took to my bed with litres of water to hand and thoughts of what I might have when I was ready to start eating again. This time, I think I even surprised myself. There was no chicken soup, stews or mash in sight. 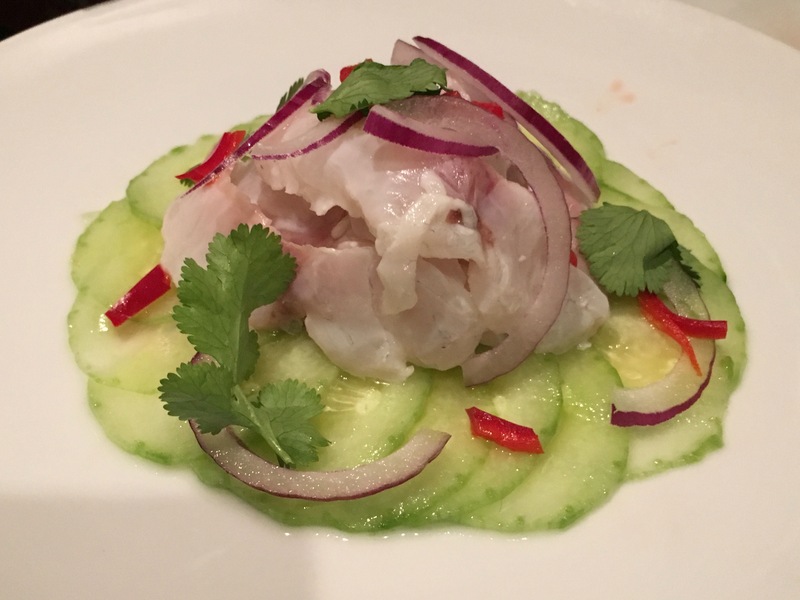 What I did with a welcome burst of energy was make ceviche. I’m not going to analyse it. But I imagine that as my body started showing signs of life, my tastebuds asserted that they did not want to be left behind. I always have cucumber in the fridge. I’ll have it fresh, salted and rinsed so it retains its bite, pickled or even as a soup. It’s probably better not to question how I have fresh sea bream, coriander and limes lying around waiting for me to come back to life. This took all of about 20 minutes. While the cucumber was being salted to draw out moisture so there was a crunchy foil to the delicate fish, I was filleting and skinning the fish. All the bones and trimming went to the freezer for stock at some point in the future. The red onions took about five to ten minutes. If you soak them in iced water, you retain the crunch while removing the harsh raw onion taste. Once I had sliced the fish, I poured over fresh lime juice and sprinkled some salt. By the time I had arranged the cucumber on the plate, the fish was ready. It was that easy. And so comforting.